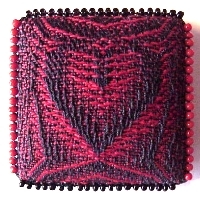 WEAVING WITH SEWING THREAD . Inspired by her observation of Nature's color mixes in her herb garden, Kim Marie Bunke of Madison, Wisconsin weaves these exquisite fabrics with sewing thread. Her work was featured in Handwoven Magazine (March/April 2000) and a soon-to-be published issue (March/April 2001). 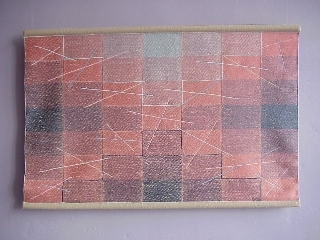 Nearly twenty years of experience has enabled me to develop my work to its current technical level, that of weaving with sewing thread as warp and weft. I make this fine fabric into scarves and postage stamp-sized pins, meticulously embellished with tiny seed beads. The beadwork echoes and enhances the woven motifs and colors. I call these works Woven Jewels (TM). One of the stamp-sized pins. I develop my own complex weave structures, doing the pattern drafting by computer. The computer serves as electronic graph paper only. I rely on my own graphic skills for designs. My work includes many naturalistic images, very detailed. Executed in fine thread, the finished pins look like finely rendered drawings or miniature etchings. This synthesis of drawing and weaving is something I've sought through my entire career. My "Vibrato" series of wallpieces refer to the idea that it is impurities or overtones that make sound beautiful. The pointillist mixed color and contrast of shimmering and matte textures create a similar fullness and beauty in fiber, a surface as rich and involved as that of a painting. I hope for atmospheric effects, an appearance of layers of mist. Handling the slippery silk feels like trying to shape smoke. These wallpieces are handwoven of silk with two elements forming an overall satin-order brocade on a plain weave base. The colors are rotated in order, reaching points of resolution, which I relate to a pulse. They are woven in strips which are later joined. It is magic to see the strips unroll from the loom, and to see relationships develop as they are placed beside each other. 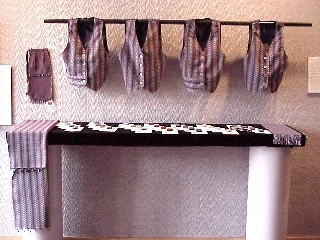 A display of her vests, scarves and pins. Kim Marie Bunke has a B.S. with a major in fine arts from the University of Wisconsin-Madison. A teacher, lecturer, writer and book reviewer, she frequently is published in Weaver's and Handwoven magazines. She sells her work here at The Dining Room at 209 Main in Monticello, WI during the exhibit and through galleries and regional fares.